Hello everyone! Sorry it’s been so long since I’ve written, but I was waiting for some inspiration…unfortunately it came to me in the form of a scratchy throat on Friday morning. The good news is I feel 100 percent healthy again and I would love to share with you my secret weapon against that I’m-getting-a-cold feeling, even when you think it may be too late. Garlic. It’s truly a miraculous little bulb of seemingly endless benefits. But I’ll cut to the chase: garlic has very powerful anti-bacterial and anti-microbial compounds that annihilate just about any nasty bug that’s decided to set up camp in your body. Garlic is also a very good source of vitamin C, which boosts the immune system. It’s like a perfect little package of prevention that you can pick up for less than a dollar at the grocery store. Imagine that. 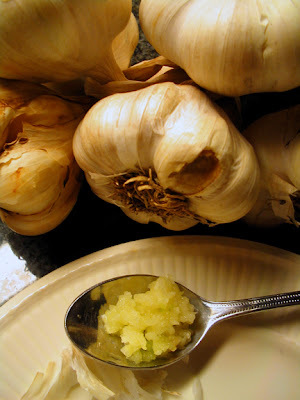 So the next time you start to feel that evil little tickle in the back of your throat try this: take one large clove of garlic, mince it up very fine and put it on a spoon, or in a glass with about 3 – 4 tablespoons of water (enough to swallow in one gulp). Then just down it. DO NOT CHEW!!! If you chew it, your mouth will burn like you won’t believe and I guarantee that no one will want to come within 10 feet of you for the next 24 hours. The next minute or so may feel a little intense as the raw, minced garlic makes its way down into your stomach, but do not drink any water as this may make you feel nauseated. Just sit back, take a few deep breaths, and relish in the fact that you have not succumbed to the evils of Neo-Citran. That’s it. That’s all I did, even though I really thought it was too late. Now of course drinking 2-3 liters of water a day (like you do everyday, right?) is also very important as it helps to flush everything through your system, but I didn’t even go stock up on oranges. I just swallowed some garlic. Please do not use pre-minced garlic from a jar, or the powdered stuff – it’s not the same and it won’t work. You can take one minced clove 2-3 times a day as you feel necessary, but if you don’t feel better within a couple days, or your cold is taking a turn for the worse, just know that your body needs to be sick for a bit and take a well-deserved rest. You can also do everyone else a favor by keeping your distance so as not to spread your germs around– you probably stink anyway. Just one teaspoon of sugar can suppress the immune system for up to six hours. A 12-ounce can of soda has 10 teaspoons. Yeah. I’ve been taking garlic in honey when I feel poorly for quite a while. I know about sugar being bad for you, but honey is apparently just as effective as cough syrup, so I think the good stuff kind of cancels out the bad in the sugar. And you get all this sugar in fruit anyway. Another question re sugar: I’m a junkie, trying to kick the sugar habit. Do agave and maple syrup affect the immune system, in the same way that white sugar does? This is so enlightening, it’s scary! Next time I crave something sweet, I’ll remember 1 teaspoon sugar = 6 hours weaker immune system! Wow! The comments are interesting too! hey – I started to feel crappy last night so… this morning when I woke up I decided to try the “shot of chopped garlic”! I was a bit apprehensive because I find raw garlic sometimes difficult to digest, but I have to say that it wasn’t that bad! I mistakenly followed it with a cup of tea and my breakfast which led to a little nausea but all in all any mild garlic breath lasted less than 2 hours and now, as the afternoon goes on, I feel better that I thought I would – so I’m eager for another dose! Claire mentioned a dose before bed would probably be a good bet so, I’ll give it a try and let you know! This may be a stupid question – but won’t all that garlic make you smelly? Do you have any immune enhancing tricks that do not involve garlic? ditto what stephanie said, I’d love to read a sugar topic sometime in the future. I’ve read about sugar in many other places, but find all the info overwhelming and confusing. If you could address alternative sweeteners and chemical sweeteners (sucralose, aspartame, there’s so many!) that would be GREAT too. Can you tell us more about sugar in your next posting? Is all refined sugar bad? Does an ideal diet have zero sugar? When do we need sugar? etc. etc.